Alexandros of Antioch (Greek: Ἀλέξανδρος) (2nd-1st century BC) was a Greek sculptor of the Hellenistic age. Alexandros appears to have been a wandering artist who worked on commission. According to inscriptions at the ancient city of Thespiae, near Mount Helicon, in Greece, he was a winner in contests for composing and singing. The inscriptions date to around 80 BCE. His father's name was Menides according to all the inscriptions. Alexandros is thought to have sculpted a statue of Alexander the Great that is also displayed at the Louvre Museum. This statue was discovered at the Greek island of Melos. His dates of birth and death are unknown. 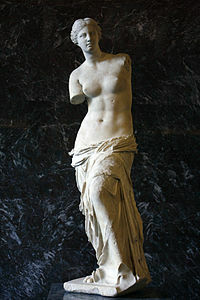 He is best known today for the Venus de Milo (Aphrodite of Milos) at the Louvre Museum in Paris, France. He is known from several ancient inscriptions including one from a now-missing plinth that was a part of the Venus de Milo but was removed and "lost" due to museum politics and national pride at the Louvre Museum in the 1820s. The inscription and the style of its lettering cast into doubt the claim that the statue was an original by the master sculptor Praxiteles from Attica. This page was last edited on 9 April 2018, at 06:36 (UTC).